The CSS ALBEMARLE was designed by Chief Constructor John L Porter, CSN, and built in the spring of 1864 by Gilbert Elliott at Edward`s Ferry on the Roanoke River. She was 122 feet long, 45 feet beam and her draft 8 feet. Her planking was 4 inches thick over 8x10 inch frames. The central shield was 60 feet long and covered by two layers of 2 inch iron plating. Her armament consisted of two 8 inch guns, one forward, the other aft, behind iron shutters. She had two engines of 200hp each. 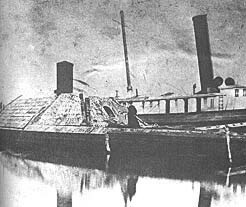 In April 1864 the newly constructed Albemarle, under the command of Capt. J.S. Cooke, was ordered to proceed down river from Hamilton to Plymouth to clear the river of federal vessels so that General Hoke`s troops could storm the forts. She anchored about three miles above the town and the pilot, John Lock, set off with two seamen in a small boat to take soundings. They found that the river was high and that there was 10 feet of water over the obstructions that the federal forces had placed in the Thoroughfare Gap. On hearing the news Capt. Cooke immediately ordered steam and, by keeping in the middle of the stream, they passed safely over the obstructions. Their armour protected them from the guns of two forts, Warren`s Neck and Boyle`s Mill, but then they discovered a new hazard coming up the river towards them. Two federal steamers, the Miami and the Southfield, lashed together with spars and chains were in the middle of the river, intending to pass on either side of Albemarle which would put her at their mercy. Capt. Cooke ran close in to the southern shore then turned to ram the Southfield amidships. Albemarle was going at full speed with the assistance of the current and she drove the federal ship straight to the bottom, taking part of her crew with her. The bow of Albemarle was pulled under water and she too would have sunk if Southfield had not rolled over when she hit the bottom and released the ram. Captain Flusser of Miami was killed when a shell he fired at point-blank range rebounded off Albemarle`s armour and exploded on Miami. Despite the death of their captain, Miami`s crew tried to board the Confederate ship but were driven back by musket fire and then used her speed to avoid the ram and escaped into Albemarle Sound. Now that the river was clear of federal ships General Hoke attacked and carried, with heavy losses to the confederate troops, the defenses of the town, assisted by Albermarle who fired her two guns into the forts all day. On 5 May battle was joined between Albemarle and a captured steamer, Bombshell, which were escorting the steamer Cotton Plant, laden with troops, down the Roanoke, and four federal side-paddlers Mattabesett, Sassacus, Wyalusing and Miami coming up Albemarle Sound. Albemarle opened fire first from her bow gun, the shells wounding six men on one of the two 100-pounder Parrott rifles on the Mattabesett, then attempted to ram her. The paddler managed to round the ram`s bow, closely followed by the Sassacus which opened up a broadside of solid 9" and 100-pound shot, all of which bounced off the sloping armour of the confederate ship. The Bombshell was a softer target and was hulled by each shot from Sassucus`s broadside. She surrendered, and was ordered to pull out of the action and anchor. When he found that he had Albemarle broadside on at a range of about 400 yards, Lieut. Cdr. Roe of Sassucus decided to ram her and called for all the steam that could be raised. The paddler struck the iron hull full and square ripping away the timbers off her own bow and twisting off the bronze beak with which she was shod. The two ships remained entangled together but the crew of Albemarle recovered quickly and fired two shells into the enemy hull which was almost touching the end of the gun barrel. One punctured the boilers, still full of steam, sending jets of steam and boiling water through the ship, scalding 13 of her crew. The other federal ships remained stopped while Sassucis broke away and drifted out of range. Miami attempted to use her torpedo and enmesh the ram`s propeller with a seine net but without success and Albemarle steamed back into the Roanoke where she was moored at Plymouth. By the autumn the Federal Government decided something must be done about the situation in North Carolina and the navy discussed a number of plans for destroying Albemarle. Commander William Cushing USN was authorized to find two small steam launches to be fitted out as spar-torpedo-boats. He found two suitable 30 foot picket boats building in New York; and he fitted them with a torpedo, invented by Engineer Lay of the USN, which was mounted at the end of a fourteen foot spar. A 12-pounder howitzer was mounted in the bow. One of the boats was lost on the way to Norfolk, but he took the other, with a crew of seven officers and men, to the federal ships waiting in the Sound off the mouth of the Roanoke. The torpedo contained an air chamber which allowed it to float in a vertical position. Pulling out the pin let a grape ball fall on a percussion cap which ignited the powder charge in the lower chamber. The device, at the end of a 14 ft. spar was released by pulling a lanyard when it was under the enemy hull. On the night of 27 October they entered the river with a small cutter in tow. The men in this had the job of surprising the picket which had been placed on a schooner alongside the wreck of the Southfield, a mile below Plymouth, and prevent them firing warning rockets. In the event they went past unchallenged and Cdr. Cushing decided to use his 22 men to board the ram and try and take her out into the stream, but as they approached the wharf they were hailed and this was quickly followed by heavy fire from the ship and the shore. By the light of a fire on the bank Cushing now discovered that Albemarle was protected against torpedo attack by a boom of floating logs; however the logs, after long immersion in the water, were covered in slime and the picket boat easily rode over them. Cushing stood in the bow and pulled the detaching and firing lines to explode the torpedo under the ram`s hull at the same time as a canister of grape struck the boat throwing them all into the freezing water. He called on his men to save themselves, stripped off his uniform, and swam out into the stream while boats searched for survivors. He was not seen and eventually, finding mud beneath his feet, he lay exhausted, half out of the water until daylight. The sun brought welcome warmth and he found that he was on the outskirts of Plymouth under the parapet of a fort. In the afternoon he managed to board a small skiff and paddled down the river until he reached the safety of a federal picket vessel. His attack had been successful. Albemarle had "a hole in her bottom big enough to drive a wagon in." She was resting in eight feet of water with her upper works above the surface. Her captain, Alexander Wharley CSN, who had been appointed to her about a month earlier, salvaged the guns and shells and used them to defend the town against the subsequent federal attack until he could see further resistance was fruitless. A smaller-scale replica of the Ram Albemarle sits on the water behind the Port o' Plymouth Museum in Plymouth, NC. In 2005 the The History Channel filmed a documentary in Plymouth titled "The Most Daring Mission of the Civil War" describing Lt. William Barker Cushing's successful raid on the C.S.S. Albemarle. In December of 2008, an incredible find related to the C.S.S. Albemarle was made at Plymouth! A 6.4" Mullane (Tennessee Sabot) Shell was discovered. The shell had not detonated and had lain undisturbed for 145 years. It is the only known intact shell fired from the Brook rifled guns on the ram Albemarle. The shell has been disarmed and conserverd and will be dedicated at the 2009 Living History Weekend in Plymouth. Fort Branch Battlefield Commission, Inc. Web Site design by Interactive Communications, Inc.